Bride Pauline was in touch with us last year about commissioning a floral wedding headpiece for her wedding. Her ceremony and reception will be set in Old Westbury, Long Island in the USA, and she was after a headpiece that was a natural extension of her bridal aesthetic. Pauline shared photos with us of her exquisite wedding gown, her half up hairstyle, and her favourite designs from our collection for inspiration. And we swooned, oh how we swooned! We see a lot of wedding dresses working with our brides. But the very moment we laid eyes on Pauline’s wedding dress we all gasped. Her chic gown burst with femininity, an abundance of lace details and an unforgettable silhouette featuring a full flowing skirt. The Florence wedding headpiece was Pauline’s favourite from our collection. She sought a fuller headpiece in ivory, gold and subtle blush pink tones. Pauline loved the warmth of blush but didn’t want any dramatic pink elements, so we kept the blush tones to a minimum. 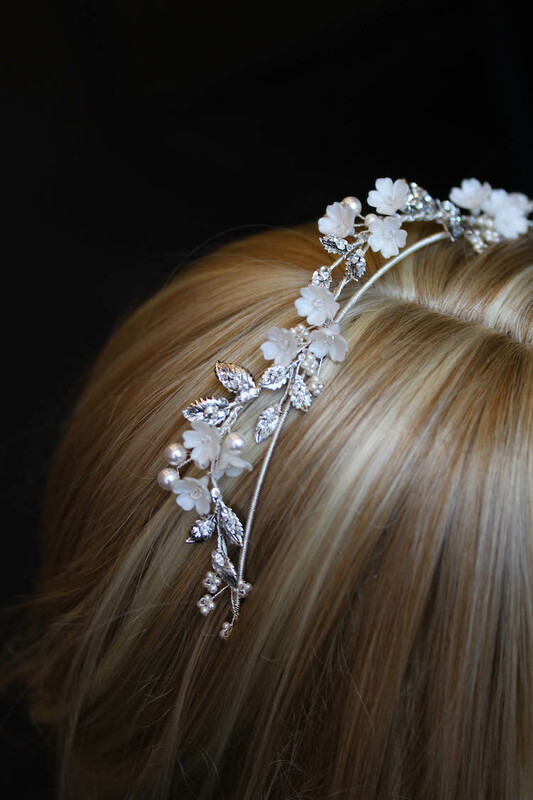 This floral wedding headpiece was inspired by the delicacy and beauty of baby’s breath and featured Pauline’s favourite elements from the Florence crown. While her headpiece is a full halo, we ensured it felt and looked lightweight whilst still bursting with floral elements. We love this crown because it suits perfectly imperfect loose curls, romantic updos and fuss free hair. This headpiece was designed to fit the circumference of Pauline’s head, and also allows for volume for when her hair is professionally styled. It secures to the hair with bobby pins which can be easily threaded through the loops at the ends of this headpiece. This headpiece can be worn with or without a wedding veil. Pauline will be wearing our Dahlia chapel veil on her wedding day so we ensured they would fit snuggling and seamlessly together. If you love this crown, or if you would love a wedding headpiece custom made just for you, get in touch. Let’s create something beautiful.